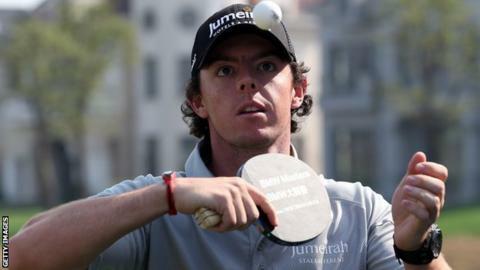 World number one Rory McIlroy will continue his bid to top the money lists on the European and United States tours at the BMW Masters in Shanghai. He has a US$1.91m lead over Tiger Woods on the PGA Tour, but can be overtaken by both Justin Rose and Branden Grace on the Europe tour this week. Luke Donald became the first man to win both money lists in one year in 2011. The field at Lake Malaren includes 11 of Europe's victorious Ryder Cup team, as well as captain Jose Maria Olazabal. Of the side that came from behind to win 14½-13½ at Medinah, Spaniard Sergio Garcia is absent, while the Republic of Ireland's Padraig Harrington and Australian Marcus Fraser are the only two of the Race to Dubai's top 30 not in Shanghai. England's Rose and South African Grace could both overtake McIlroy with victory in China, with the Northern Ireland player on guard after finishing second on the European money list in two of the last three years. "It would be good to knock that off and try and do what Luke did last year and win the money list on both tours," said the 23-year-old. "I've got a big run left in my year with four tournaments in the next five weeks, so I would like to finish off the season as well as I can. "I've got Justin and Branden right behind me and there is still some big-money events still to play, so I've four events left and if I do play well in those four events hopefully I can achieve that goal." If McIlroy finishes outside the top seven, a top-two result would see Rose take over at the top of the Race to Dubai. Rose, who won the European Tour title in 2007, is drawn with McIlroy and fellow Englishman Lee Westwood in the final group that tees off at 04:20 BST on Thursday. "There are some big events coming up and an exciting finish to the Race to Dubai," said Rose, who trails McIlroy by 437,000 euros (£353,000). "I think Rory is playing more tournaments than me in the lead-up, so I am going to have to play well, absolutely. "To be number one of any tour around the world, especially the European Tour, that's a huge goal and would be a huge honour."